Stormcloak Vanguard is a common Strength creature card. It is part of the Heroes of Skyrim expansion. 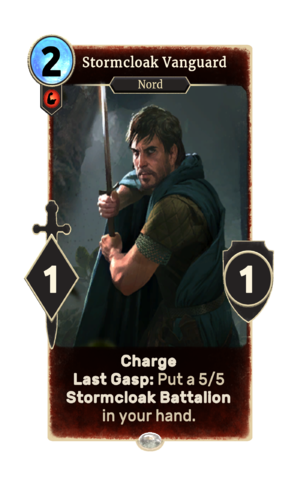 In addition to the card's availability in the Heroes of Skyrim expansion, two copies are included in the Aela's Companions theme deck. "The Nords must take back Skyrim." This page was last modified on 9 March 2019, at 16:16.